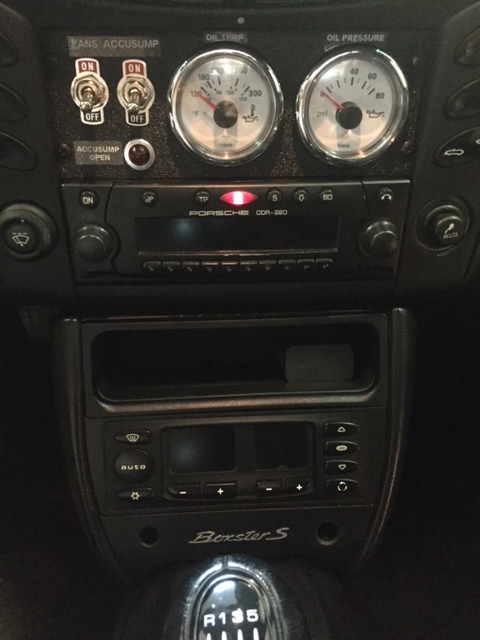 Finally finished the 2 qt Accusump install on my 02 Boxster S 3.2. I spent about $700 in all. Sorry, I dropped the ball as I didn't take any pictures of the installation but next time I have it up on jack stands I will take a few with the covers removed. Here's the drawing I did for the tunnel install. It doesn't include the electrical schematics. If anyone wants part numbers, PM me. I don't want to offend anyone or endorse any particular supplier It's just what I used, and my goal was to do the highest quality installation but shopping around for every component to find the best deal/price (especially fittings). 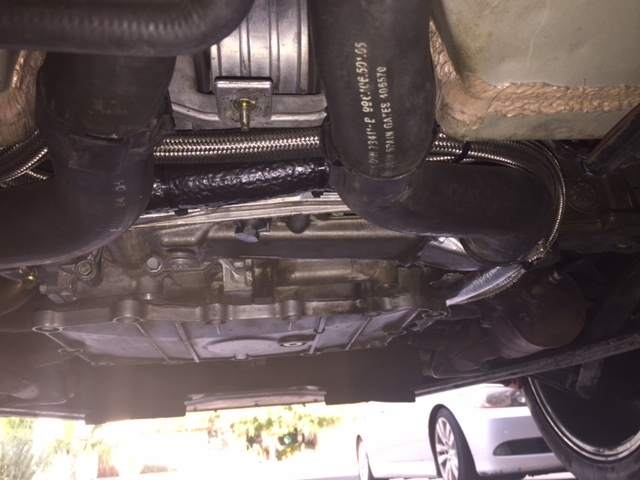 I did not want to mount the accusump in the rear trunk area as that seemed like a bad idea with heat right next to the DME and having to poke holes in the trunk (not to mention leaks etc...). 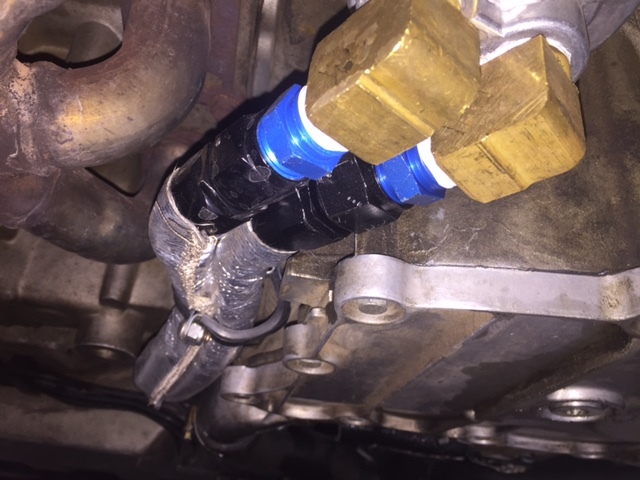 I also ended up doing the remote oil filter mount instead of using a sandwich plate as I don't have a sump extension and I didn't want the filter to protrude beyond the oil sump. So, it worked out perfect. The 2 quart fits well in the tunnel and I fabbed 2 mounting brackets out of flat aluminum stock that attach to the existing coolant pipe mounts and that attach to both mounting clamps on both ends of the cylinder. I bought a used 2 qt accusump with 35-40 psi EPC solenoid valve with pressure switch, had it rebuilt by Canton Racing. All the fittings are black anodized -10AN and the hose is 10AN SS braided Aeroquip 300F / 1,000 psi hose with a min bend radius of 4in. I wanted to use the PTFE hose, but that stuff is wayyyy too stiff... I used a remote oil filter take-off plate mounted to the LNE spin-on oil adapter, and mounted the remote oil filter mount on the vertical wall right next to the water pump area, and used a Napa Gold 1042 spin on filter. There is just enough room to mount it there. It is tight, but with the correct angled fittings, it is doable. I can easily access the oil filter now. 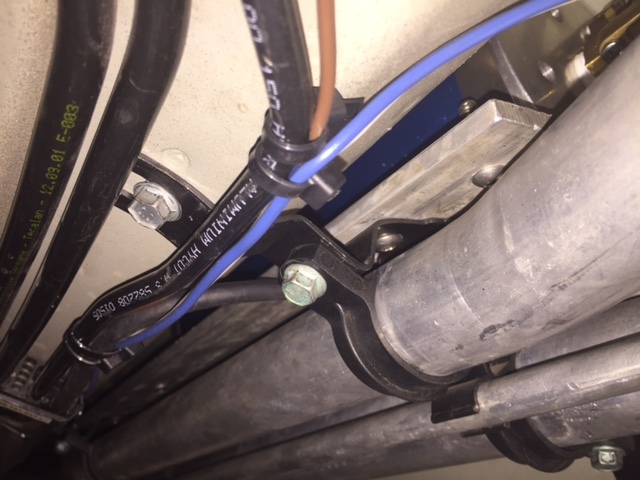 For electrical, I installed an ON/OFF toggle switch on the left side of the batwing insert, and an idiot light (pilot light) on the right side of the batwing insert for when the accusump is dumping (<40 psi). The electrical circuit is pretty simple, just run a fuse tap from the C4 fuse (switched) next to the dead pedal, run it through the master switch, through the NC contact on the EPC pressure switch, then to the solenoid valve. Ground the other solenoid valve wire. I ran another wire from the NC contact of the pressure switch to the idiot light. Ground the other idiot light wire. Before starting for the first time, I pre-filled the oil filter with oil before installation, then hand cranked the engine by hand for about 10 revolutions as I didn't want to start the engine dry Then, I removed the fuel pump fuse, and crank the engine for a couple 5 second increments to oil up the engine prior to firing it up. Finally, I re-installed the fuel pump fuse and fired up the engine. With the Accusump off, first thing I checked was the oil pressure gauge on the remote oil filter mount, reading 50 psi, so I breathed a sigh of relief... Then I turned the accusump master switch ON and saw about 50 psi on the air side, so I knew that was working too. Then, then last test was to see if the pre-oiling worked. I made sure I revved up the engine before turning the master switch off, then turned the key to the on position and observed the accusump idiot light ON and heard the oil pre-filling the engine. Then I started the engine and that was such a smooth start! No clatter whatsoever! Inspected everything for leaks, all was good, so I buttoned everything up and took it for a ride. 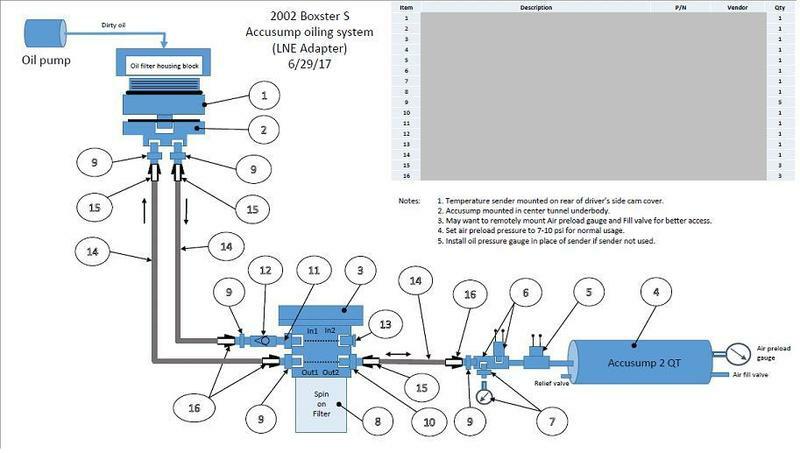 * As the oil gets hotter, the accusump idiot light (on when accusump dumping) turns on at RPMs<2,200, so at idle and at low rpms. * Have to rev up RPMs > 3,000 to recharge the accusump, especially prior to shutting off engine. I might just use the pre-oiling then shut the accusump off for street driving, unless there is a benefit to keeping it on all the time? For DE, track and Auto-X days, it will stay on all the time. Last edited by AZ986S; 07-14-2017 at 03:43 PM. Nice writeup. If anyone is thinking of doing this, I have a 3-qt accusump system that I will be selling soon. One thing that I would consider is adding a city mode switch with a timed relay. So when you turn the key to the ON position, the relay would engage the EPC valve for 5 seconds or so then turn it off so it can be recharged and so it doesn't dump all the time at red light stops. This would be ideal for the pre-oiling function. OK so I promised I would get some photos from my Accusump installation in the tunnel. IMHO this is the best spot to put it if you can. Out of sight, doesn't take up any trunk space, doesn't heat up up the ECU etc... The only compromise is that it is difficult to access it and hard to see the gauge on the air side. My thought is to put a remotely mounted gauge using an electric sender, probably in the cabin. I haven't used it on the track yet, but I'm heading to Inde Motorsports Ranch in Wilcox, AZ on Labor Day weekend. So the way I use it is I power up the Accusump master switch just prior to starting the engine for a few seconds in order to pre-oil. Engine starts soooo much smoother. This has got to be good for reducing startup wear... I then turn it off and let it recharge during normal street driving. If I leave it on, it will start dumping at every stop or light. Here is a photo of the gauge and panel I custom made. I have 2 switches: 1 for the Accusump and 1 for the radiator fans (high speed). I tried to match the gauge bezel color with the instrument cluster gauge bezels (chrome), but the gauge bezels protrude way more than I like, so I might have to redo the faceplate with 48 mm dia holes to flush mount the gauges. I wired the existing oil pressure switch wire that goes to the instrument cluster low oil pressure warning light in parallel to the oil pressure gauge warning light, so they both come on when oil pressure is below 7 psi. The issue I have now is that the lights come on when oil is at temp (190-200F), whereas it didn't before, so I assume the original pressure switch is set to something less than 7 psi. Now that was annoying me, so I upgraded to latest oil pressure relief valve and spring, thinking the low oil pressure was caused by a broken spring or bound piston. 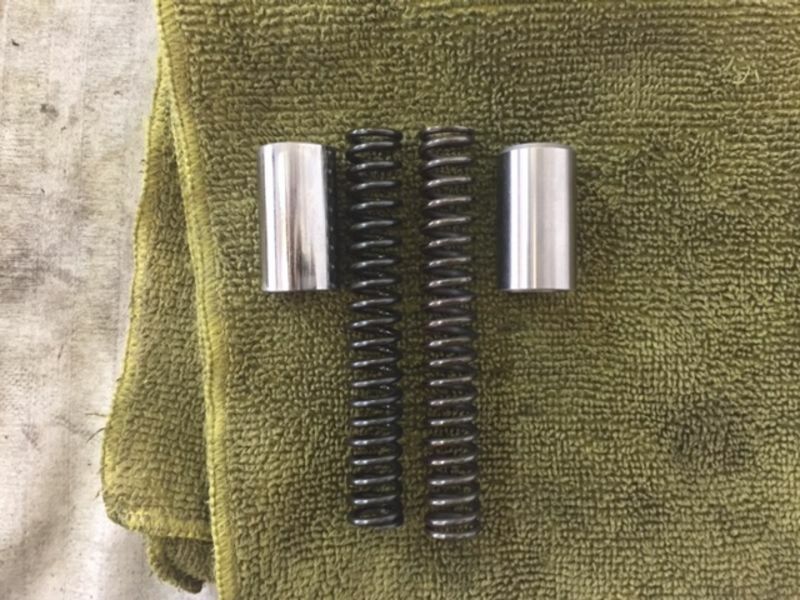 On the upgraded parts, the spring is slightly longer and the piston has the bevel on top, but the old piston and springs looked just fine. Very nice install! I have the VDO Oil gauge and have had the warning light flicker once at idle after coming off a hot track session. I have actually gone to 10W50 and the oil.pressure seems to be a little better when hot vs 5W40. Did you replace your original oil pressure sender switch with the dual 7 psi warning contact / sender unit from VDO? Did you install the larger bezel on the gauges or is your install flush mounted? What oil are you using now? I was thinking of trying the Mobil 1 5w50 if I still see low low idle pressure. Yeah, my original oil pressure switch was replaced with the VDO brand dual oil pressure sensor/low pressure switch. I am on Millers Nano 10W50 (previously Millers Nano 5W40) but I have heard nothing but good about the Mobil 1 5W50. When I removed the bolt, well over 3 quarts of oil came out and kept on going before I put the bolt back in. I believe this was because I have an Accusump and a remote oil filter, but can anybody explain this!!! How could this happen if the full flow oil filter still has an anti drainback valve? Or is there something else I am missing? Low oil pressure!! Even with 5w50? OK, here's an update on my low oil pressure issues. 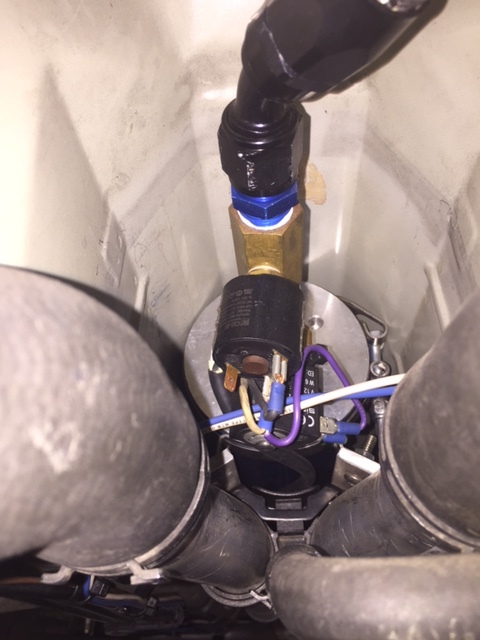 As mentioned previously, I've installed a 2 qt Accusump with a remote oil filter with a 1042 Napa Gold filter. I Also installed VDO oil temp and oil pressure gauges replacing the original oil pressure switch with the dual switch/sender unit from VDO. I then originally filled with Total Quartz 5w40 oil which I had been using for the last year without issues before the accusump install (no low oil pressure, at least no warning light). When the oil temp gets hotter than 200F, it will set the low oil pressure warning light (7 psi or less) at idle. In a quest to fix the low oil pressure, I upgraded the pressure relief valve as mentioned in this thread, with no difference in the oil pressure. I then filled with Motul 8100 xcess 5w40 oil. This weekend I went to a DE event at INDE Motorsport Ranch in AZ, and, while reviewing the video footage, noticed that the accusump dumping light I installed on my dash was coming ON on hard right turns, and also less on left turns. What I didn't like is that occasionally, the low oil pressure warning light would come ON (maybe a flicker but sometimes 1-2 seconds) on those prolonged (6-7 seconds) right hand turns!!!! I din't notice it at the track (focused on driving). What the heck is going on? Could the oil pump itself be worn out? At startup, I do get up to 60 psi cold, but then it quickly goes down as the oil heats up. Could the filter be creating too much oil pressure drop? 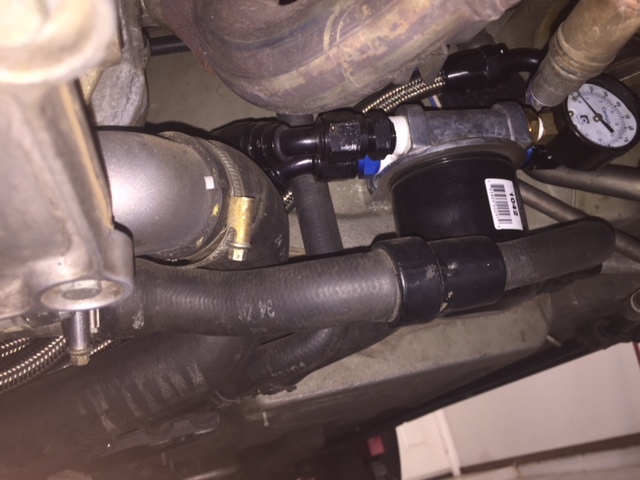 (accusump is AFTER the oil filter, and there is a check valve to prevent backflow). I'm thinking that the oil pump does not have enough pressure/flow to refill the Accusump and that is why I'm seeing the low pressure light at the track. This should not happen with an Accusump! JFP in PA, any ideas? Can these pumps wear? Do I need a coarser filter like the LNE washable one? Or are my bearings worn out? Engine has 81,000 miles and runs great! BTW it was a blast at INDE, as I'll post some video. Oil temp did not get above 235F. And BTW I'm on street tires (R-S3s). Last edited by AZ986S; 09-03-2017 at 04:48 PM. Ir it were my car I would replace the oil pump. We have seen the oil pumps go bad, usually from accumulated debris in the oil. The oil pump drives are also known to fail, but those usually just snap leaving you without any oil. The is also a pressure regulator system in the pump that consists of a piston and spring which can fail, lowering the oil pressure. This is the easiest thing to check as you can remove it through an external plug, and there is an updated replacement set up specifically to improve low RPM oil pressure. As the updated components sell for around $20, I'd start there. If that doesn't work, pull the pump casset and check the pump for wear. Last edited by JFP in PA; 09-04-2017 at 06:26 AM. When I dropped my oil pan cover the first time, the oil.pickup tube was covered in snake like strands of sealant, possibly blocking some flow. Once the accusump is pressurized, it doesn't take any oil away from the system. When it is recharging, it does take some oil pressure away but I think it is not major. The 1042 filter is used on corvettes and the like, it is a very high flow filter, I don't think it I your issue. First off I love AN hose and fittings. I also see that you changed the relief spring and piston. Looking at your pics from a fluid flow dynamics perspective my first thought was "wow those high pressure brass 90s from the adaptor are hugely restrictive". I'm pretty sure this was done to create a solid support for the hoses etc from the dynamics encountered during racing but unfortunately 90 degree fittings are basically a block wall to fluid flow. And this is the first and last thing the oil pump sees. Add to this the restricted id for high pressure and this is probably affecting fluid flow and ultimately pressure, (Decrease velocity ( the 90), increase pressure (pump discharge) creating a pressure drop across each 90 . 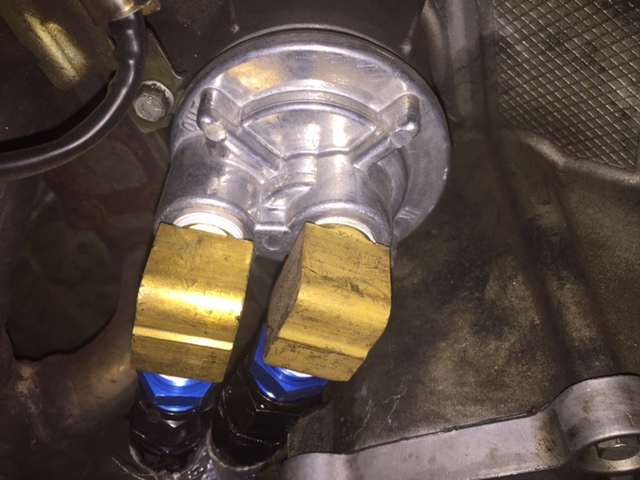 Before jumping into the deep end and replacing parts, FWIW My .02 and an easy test is to remove the brass 90s, install 1/2" to -10 AN bushings into the adaptor, then a 90 deg -10 AN ell to your hose. The larger id and smooth radius of the AN fitting will be much less restrictive to fluid flow. Last edited by 911monty; 09-04-2017 at 08:28 AM. I think I saw low profile AN "Ls" available, so that may help for clearance, but probably won't be as good as the smooth flowing standard "L". Is the Low RPM kit different than this?